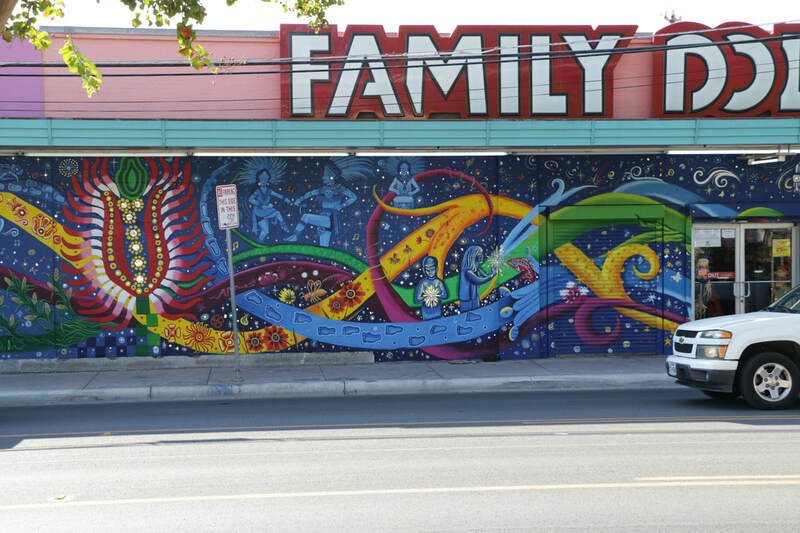 This massive mural spans the side of a Guadalupe Cultural Arts building and Family Dollar. The left of the mural ​shows San Anto artists painting the wall, but also has images that represent music (accordion), theater (masks), and cinematography (roll of film) on the West Side. In the center of the mural Manny Castillo, San Anto’s founder, wears a San Anto t-shirt and holds brushes as though he were inviting viewers to paint. Behind Manny is Lanier High School, which is just around the corner from this mural. 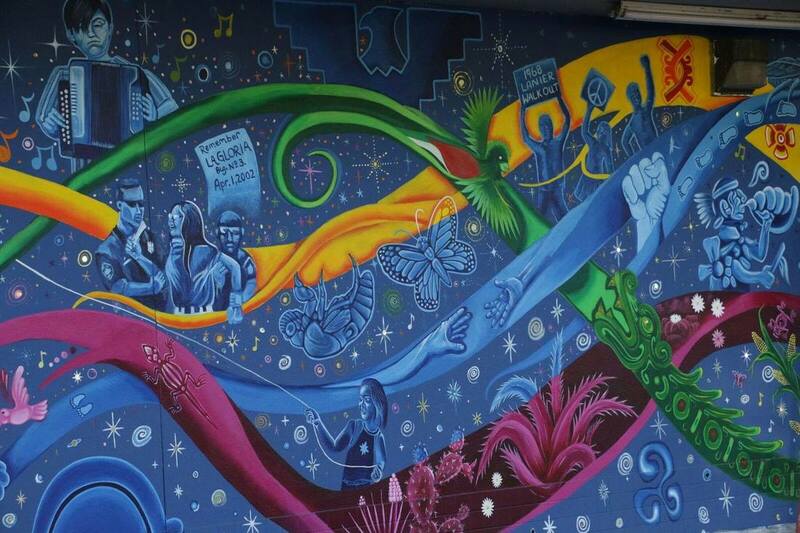 Manny passed away in 2009, but the butterflies surrounding Manny and scattered throughout the rest of the mural represent the spirits of ancestors among us. The next portion of the mural is more ethereal and dreamlike, representing a stream of important barrio memories. Members of the San Anto community protest the demolition of La Gloria, an event that gave rise to the formation of the Westside Preservation Alliance. The mural also shows students walking out of Lanier high school in 1968 to protest systemic racial prejudice. The mural incorporates chicano and Aztec imagery, with the uprising fist next to a traditional conchero. ​The far end of the mural features La Malinche, the Nahua princess who guided and translated for Hernán Cortés during the conquest of Mexico. La Malinche represents the complicated, blended history of Mexico, and the mural flows from her as though she is speaking it.